A boxing bag stand is ideal if you want all the benefits of a hanging heavy punching bag, but you’re limited on where you can hang it. It’s essential that you get the best possible boxing bag stand for your budget and needs, as an inadequate one can fall apart and lead to injuries. I’ve compiled a list of the top 5 best boxing bag stands, where some are able to support a speed bag as well as a heavy bag. You can scroll down below the table to find more information on each boxing bag stand. Footprint Dimensions (D x W) 30" x 30"
(each leg can extend 12" - 15") 69" x 48.25" 35" x 52" 69" x 48.25" 48" x 60"
Max. Height 90" (7.5 ft.) 84.13" 95" 84" 86"
For all heavy bag stands, it’s highly recommended that you use the right tools to ensure that every bolt and screw is tightened as much as possible. It’s also a good idea to use heavy weight plates to stabilize the stand. Bear in mind that most boxing bag stands designed for homes are not very tall. So if you’re over 6 ft. tall, you may have to adjust the hanging chain on your boxing bag. 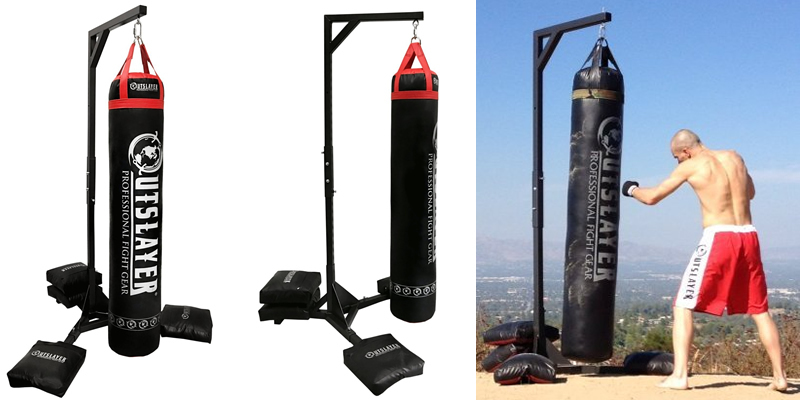 Here are the above boxing bag stands in more detail. Constructed of 11 gauge steel. Able to supports any heavy bag up to 350 pounds. It stands at 7.5 ft. tall. Each leg can extend an extra 12-15 inches. Includes 4 unfilled sandbags to weigh down the stand. With only 5 screws to assemble the entire stand, it’s an easy job. 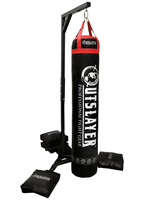 The Outslayer Heavy Bag Stand is the most versatile boxing bag stand on this list. It’s actually designed for Muay Thai, but it’s also a perfect fit for boxing bags because it’s more spacious (allows enough room to kick without worrying about hitting the steel construction). 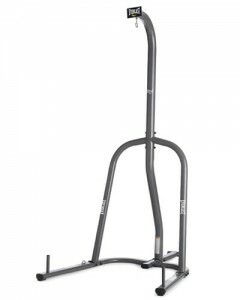 It’s a definite must-have if you weigh over 180 lbs, over 6 ft. tall and/or you’re a serious athlete who trains intensely. It’s very well-constructed and has a triangular base, making it well suited to fit in corners. 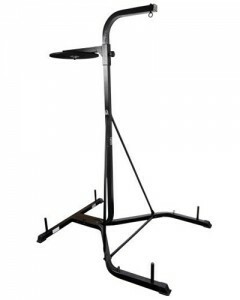 It stands at 7.5 ft. tall so you need to make sure that your ceiling is high enough to easily fit this stand in. The quality is top notch and it’s well designed, making it far superior to most of the boxing/MMA heavy bag stands around its price range and below. Heavy duty, powder coated steel tubing. Supports any heavy bag up to 100 pounds. 3 weight plate pegs to support the entire stand. 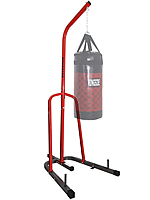 Basic and easy to assemble, the Everlast Heavy Bag Stand is able to support any heavy bag up to 100 lbs. Most users have praised its sturdiness and how easy it is to set up. There’s a leg that sticks out directly behind the center support pole, so it cannot be placed too close to a wall or corner. This boxing bag stand is simple and good value, but once again, if you stand near 6 ft. tall or above, you may want to get something a bit bigger unless space is limited. Can adjust the height of the speed bag platform. 2 hooks on the legs provides extra stability to the heavy bag. 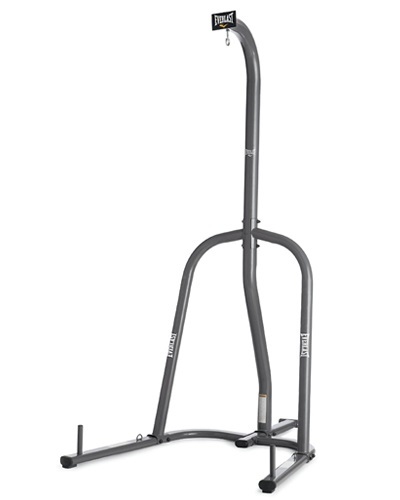 The 2-Station Everlast Heavy & Speed Bag Stand is a good choice for anyone who wants to hang a heavy bag and a speed bag on a budget. It’s most suitable for anyone under 6 ft. tall, but if you’re taller, the speed bag may be too low and the heavy bag chain would have to be shortened. Also, if you’re a hard hitting adult who weighs over 180 lbs, then it’s probably a good idea to get a stand that can withstand the force you’re putting out, such as the Outslayer Heavy Bag Stand. The following boxing bag stands were formerly on our top 5, but due to unavailability and the release of better stands, they’ve been pushed out. However, they are still worth a look. Constructed from heavy-duty, powder-coated, 1.5 mm gauge square tube steel. Pro style swivel on speed bag platform. Easily fits under 8 ft. ceilings. 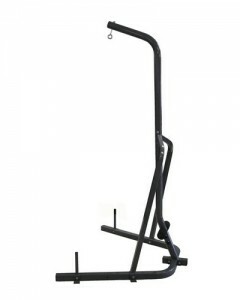 Title is renowned for their quality on boxing equipment, and their Title Heavy & Speed Bag Stand combination is well constructed and most suitable for anyone under 6 ft. tall. 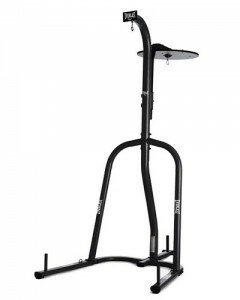 It’s straightforward to assemble and I would consider this boxing bag stand to be pound-for-pound one of the best value for money boxing bag stands due to its inexpensive price and high quality. 2 weight plate pegs to support the entire stand. Scratch and rust resistant powder coated finish. Solidly built and incorporating a simple design, the Amber Sports The Champ Heavybag Stand is taller than many other boxing bag stands around its price range. This makes it more suited to those who are at least 6 ft. tall. It doesn’t take up much floor space and it also doesn’t have a large leg sticking out the back, so it can be placed closer to a wall or corner. Overall, this boxing bag stand provides good value for money.